Training had gone well with no major injuries of sort. I had pushed my mileage up to a final long run of 20 miles which was a first. Normally I max at 18 miles in training and let the occasion of the day get me through the remaining miles. After a good night’s sleep in our Amstelveen hotel we prepared to head to the expo, one of my favourite things on a marathon weekend away. However, an emergency occurred – Ro had forgotten her hairbrush. Panic ensued but after some discussion I managed to get her out to the supermarket to purchase a new one. All was good again and off to the expo at Sporthallen Zuid we went. At the expo a huge running trainer greeted runners at the entrance and inside runners all held the same carrier bag with their bib number within. The bib pick-up point was within a fairly small area so collection was quick. The chip was attached to the back of the race number, another first for me. 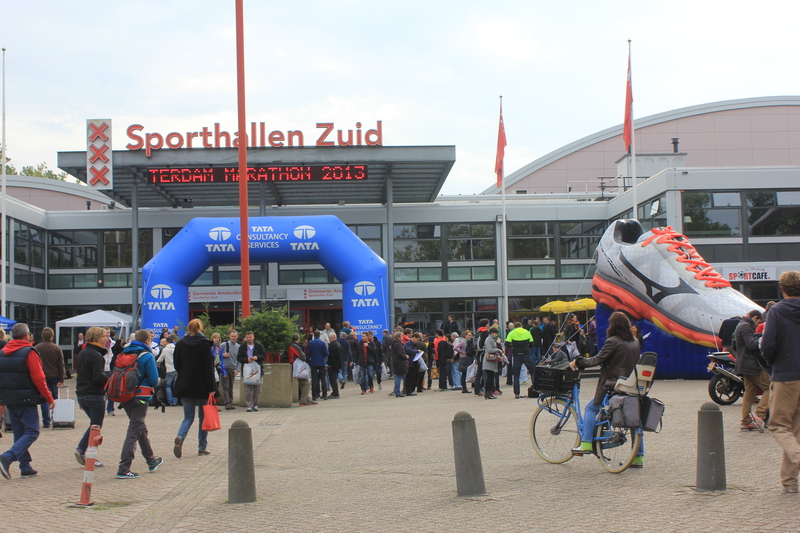 In the main hall of the expo, not one of the biggest, there were the usual stalls selling discounted running attire, nutrition and drinks, and displaying leaflets for various European marathons. Post expo we hurriedly looked around central Amsterdam then pre-race carb loaded with a pasta meal at the worst restaurant ever, La Traviata. Should have gone Argentinian (there were plenty around). Race day weather was bleak, grey and wet. The Mizuno Half Marathon which Ro was doing didn’t start until 1.30 pm so I awoke early for the marathon’s 9:30 am start and left Ro in bed and traveled to the Olympic Stadium. Public transport was unexpectedly sporadic so I was lucky to get a lift with some runners from Wales at the hotel who kindly let me have a seat on their coach. Bag drop off at the stadium was particularly easy – bags were dropped off at the designated gazebos lined up outside the stadium and a small hand written sticker, with your bib number on it, placed onto your race bib. Into the stadium and with crowd support starting to build in the grandstand I felt, for a minute or two, like a professional athlete. Grouped together around half the track in our respective colour-coded sections the hooter went and I was over the start line in about eight minutes – slower than expected and carrying the memory of a fellow runner squatting for last-minute toilet relief at my feet as I shuffled to to the start. Out of the stadium to a brass band and a supporting crowd the course peeled away from the stadium and I found my pace fairly quickly. As the crowd thinned I introduced music to my run for the first time ever and what a boost that was. Autumn weather in the Netherlands is very similar to the UK, wet, so I had familiar running conditions. With the wet weather planting of feet with each stride was key as was paying attention to the tram tracks on the road. As expected the course was flat with only a very slight occasional gradient. Drink and food stations were roughly every 5 km, with a mixture of water, AA-drink Iso-Lemon and bananas. Weaving through the streets the best sight along the course for me was the newly reopened Rijksmuseum at 4 km, where the course took us through the middle of the museum (outside) – a nice touch I thought. The rest of the course, I have to admit, was rather non-descript. From around 12 km the course hit the Amstel river section within Amstel Park and from here we proceeded to run around it for around 13 km which I found quite dull, with no crowd support other than a floating boat with a band on. Good idea to have your personal music turned up loud. The only highlight for me was seeing two goats standing on a tree stump watching all the runners go by, it bought a smile to everyone. From here the course headed back towards the finish line. I felt in good shape and in total control. With the final leg cutting through Vondelpark, the thought of the Olympic Stadium finish hit me and gave me an extra lift. However, at around 41 km my right knee did start to pain which slowed me down slightly. Coming onto the final road leading to the stadium crowds were at there biggest, cheering runners on, and the brass band was still playing. Here I heard ‘Dano!! !’ and there was Ro on the sidelines just before she headed off to start the half marathon. I managed to shout out ‘good luck’. Into the stadium and I felt like an Olympian. Crowds were all over the grandstands, music blared and three quarters around the stadium was the finish line. This made up for the rather dull course. Other than my slightly sore knee I was feeling physically fine and mentally sound. Medal received and runners were ushered around the track and outside the stadium where we received more AA-drink Iso-Lemon and an orange slice but no goodie bag. 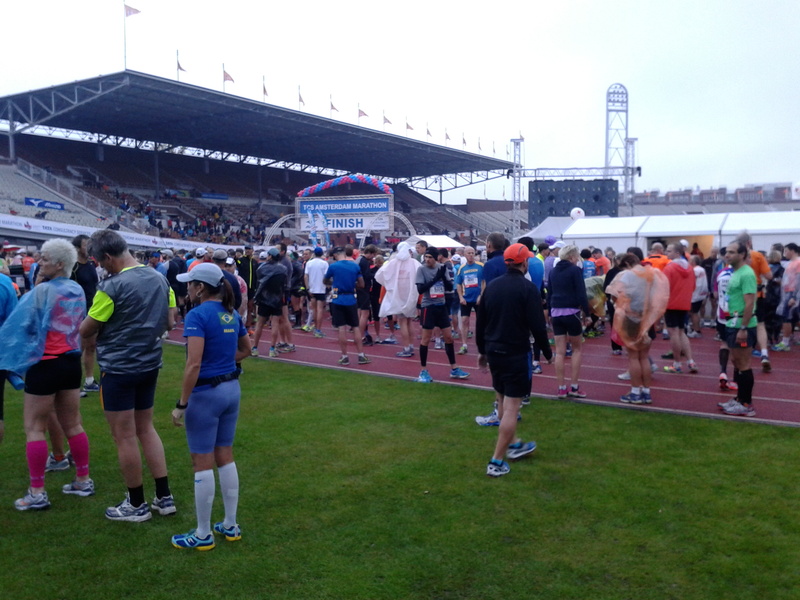 I returned to the stadium soon after to watch the other finishers and for Ro to finish the half. 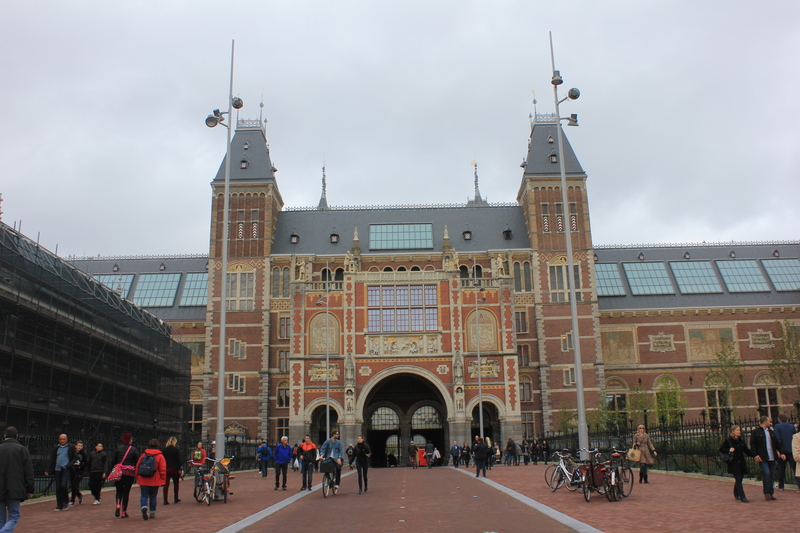 I would return to Amsterdam Marathon if only to see the goats again and improve my PB on its flat course.